Here is a few of mine. The coffee cups still needs a border round it and the Betty Boop still needs some of her leg doing. I am having trouble finding the Madeira thread to finish it...don't want to change to DMC incase you notice the difference. I know what you mean, that's why I don't really do bigger pictures, I'm too impatient!!! Poppett, absolutely love the coffee cups! They are gorgeous, you must let us see a picture when finished. I tend to stick to stitching one project at a time from start to finish and then move onto the next one. How do you decide where to stop one for a while and start another? Do you stop as you fancy a change? The coffee cups was the one I was working on before this horse racing chart came through. I really wanted to get on with this as there is a story behind it. Last year my father-in-law was 60 and at the time we couldn't afford to get him anything special, so I'm hoping to get this finished for his birthday this year (July.....tall order!). So I will get round to completing the coffee cups one, maybe take that one into work and stitch a bit during break times. hiyas, i used to do cross stitch at school,,im now 36, wouldnt mind giving it another go,, when im on nights at work etc ,, dont really no where to start tho.. what aida? dmc, madeira?? id love to do the card things, that way id kill 2 birds with 1 stone so as to speak!! I've done cross stitch for years.I do a lot of antique samplers and I do love doing cats.I've made cushions,bags ect.I have so many pieces of finished work I know I'll never use them for anything. My favourite project which I have framed on my wall,is a Dutch sampler I made about 15 years ago,it took me ages to do but was worth it. 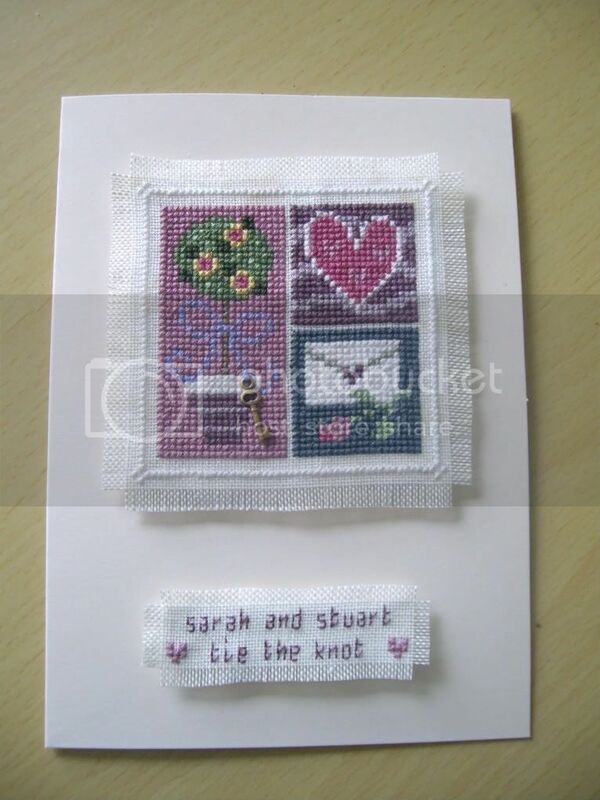 I think there should be a warning on cross stitch kits ect,it's just so addictive. 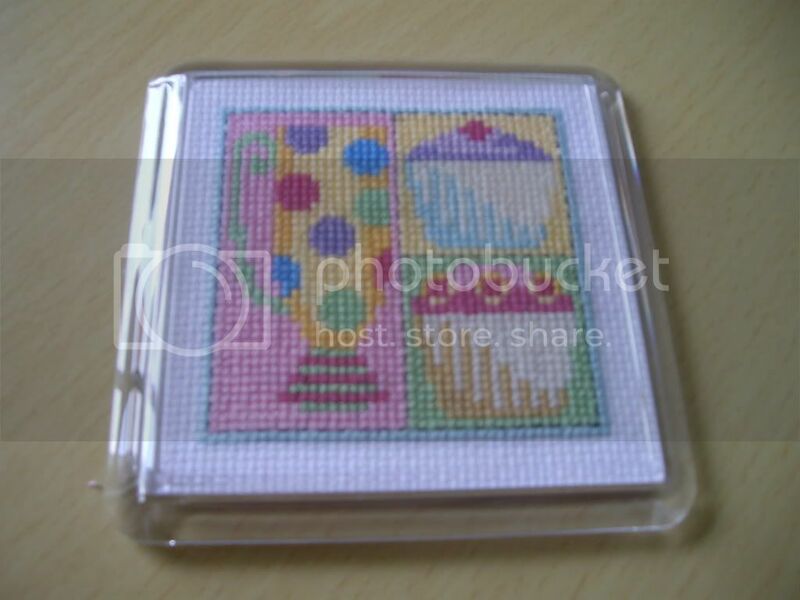 I would suggest you bought a cross stitch mag with a mini free kit on to begin with again. Then you'll soon find yourself searching the craft shops! I wouldn't go for madeira threads now as I am finding their stockists few and far between. I have made myself a large collection of madeira threads over the years that I have been sewing but now replacing them is getting harder and harder. I have resorted to starting again with DMC. eBay is a good place to pick up cheapie kits and materials. I agree about getting a mag with a free kit, these can often be turned into cards as they tend to be small. Happy stitching! Completely agree about cross stitch being addictive!!! Card making is an addictive craft as well so I combined the two to satisfy both needs! Where do you get your kits/materials mrslittlemouse? I buy threads,fabrics ect from a local craft shop also John Lewis.I use Readicut and often use the adverts in the crosstitching mags.I do find you can get some good bargains from these mag adverts and they've always been good quality.I've never had any problems with mail order.I must admit I do tend to stockpile as I see a kit or some fabric or threads and just have to have them. I'm just about to start some needlepoint with a kit I bought over 20 years ago and never even opened till two days ago,so I hope everything is ok otherwise I'm going to have to make some adjustments as I'll never get it changed now. I love cross stitching. I find it quite relaxing. Only last night did I tip the house upside down looking for my stitching things. Can't find them anywhere (we moved here a year ago and think they ended up in the loft) I bugged hubby all evening to go up there for me! I tend to buy the kits as they come with everything you need. Does it work out much cheaper to buy or download a chart then buy the threads and material seperately? Is everything you need listed on the charts like it is when you buy a kit? Hi Shelly, so did your OH get up in the loft last night or not? Would love to know!!! I buy a mixture of charts and kits - probably mostly charts (buy most of these via ebay). American designers tend to produce charts rather than kits so you have to buy seperate threads and fabric. Charts do list what threads you need - usually DMC and Anchor (and sometimes Madiera) and usually recommends a fabric to use. I tend to buy larger pieces of fabric (currently got some 32 count evenweave, 14 and 16 count aida) and cut off the size I need for what I am going to stitch. Not sure if this is cost saving :confused: . What it does mean is that if I buy a chart I have so many threads and bits of fabric that I can usually start stitching straight away if I want to. Does that help? What kind of designs do you like Shelly? What kind of designs do I like? Well if I had the patience I'd love to do something like mrsmcawber's ladies in old fashioned flowing dresses, but I tend to favour samplers that have lots of little seperate things to stitch so that I can actually see the progress I am making. I can't really choose exactly what kind of designs I like as its so varied. I just go for something that catches my eye and that I know I have the patience to do. Tend to go for smaller projects. Last edited by shelly; 30-05-2008 at 2:36 PM. I don't think my OH would have gone into the loft for me either but would shoot up there as soon as I started to talk about buying new things! I have bought fabric at half metre/metre lengths (www.sewandso.co.uk are quite good as they stock so many fabrics but you can get cheaper if you look about) and cut it but if you are going to buy a piece for a specific project you would need to add any room around the design you need for border, framing etc. I tend to use more fabric than I need and any bits cut off can be used for small designs for cards etc. I try not to waste any! I always buy my fabric at least 6" bigger on both measurements...It sounds like a lot of waste but I mount and frame my own and that gives you enough to pull around the back of the frame. If I come across a cheap enough lady I'll buy her and see how I get on. Good luck, let us know how you get on and post a pic when you finish!! !